Shelf United’s hopes of keeping the West Riding Trophy in Calderdale, after Sowerby Bridge’s success last season, were ended when they lost 4-1 away to Wortley in the fifth round on Saturday. The visitors led 1-0 at half time on a big, heavy pitch at Leeds but found it hard going against the wind in the second half and the writing was on the wall when they conceded two goals in five minutes after the break. Manager John Lister felt that it was an opportunity missed. “We had three or four players missing and only one sub. Shelf took the lead when Harry Talbot’s good through ball led to Ben Grech beating the keeper one-on-one after half an hour. A couple more decent chances went begging for the visitors. Wortley drew level with a fine finish and doubled their lead when James Goodwin scored an own goal while attempting to clear a ball cut back from the byline. 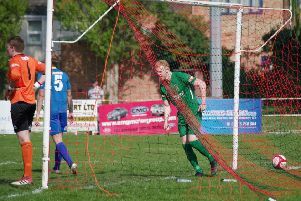 James Waggott hit a post but then conceded a penalty when the ball hit his hand at the other end. Wortley scored from the spot and although Shelf battled hard to get back into it in the last 20 minutes, the home side added a fourth on the break.